Physician Talks of "Peaceful Death"
Who Shares the Reins on Reindeer Herding? After months of preparation, the University has successfully launched the first module of PeopleSoft’s student administration software in the offices of undergraduate and graduate admissions. The University’s admissions staff on March 29 became the first functional users ("end-users") of the PeopleSoft "enterprise-wide" administrative database and software that is part of a multi-year effort to overhaul all administrative service computing on campus. Implementation of the first phase of the PeopleSoft product passed without much notice, but that is exactly what the Integrated Administrative Systems (IAS) project team and end-user staff in the admissions units had hoped for as they inaugurated the new applicant-prospect data-collection module. The module will provide a new point of entry for thousands of data records for prospective applicants to the University. "As far as we’re concerned, an uneventful first day with a system of this size and complexity is the best we could have hoped to achieve," said Michael DeRensis, the functional implementation team leader for the student administration project. "The fact that we’ve got our users trained, up and running with the prospects system in a little over two-months of focused preparation is a tremendous testimony to the hard work, dedication and extraordinary efforts of our technical and functional teams." The new system features a sophisticated search-match process to verify potential duplications of records within a database shared by all University offices. Once entered, the core data about an individual is shared with all users. As a result, students and employees no longer need to notify multiple University offices of changes in personal data, such as addresses. "If they move, notification to any office is every bit as good as notification to all offices," DeRensis explained. The system will also permit the admissions offices to track very detailed records of communication between the University and prospects. "With the new system, we’ll be able to know significantly more about students who have expressed interest in the University at Albany," said Sheila Mahan, director of the University’s enrollment management effort. "Our ability to personalize and tailor our communications with them will improve the overall recruitment effort." The system also incorporates a process that allows prospective applicants to enter themselves into the system and departments to refer prospects. Since the initial installation of the software in May of last year, the University’s project teams have been busy analyzing the software’s ability to "fit" with Albany’s own business processes. The teams have trained nearly 60 functional and technical users to prepare for the complex task of weaving together all of the campus’s diverse administrative functions into a single database environment. "Although we are taking ownership of the vast majority of the design and development work for our PeopleSoft systems, their consultants proved to be a valuable resource in providing a template for collecting the hundreds of tasks that are required to pull together any single phase of the implementation" said Marybeth Salmon, director of University Business Systems and lead manager for the IAS project. "We think that we’ve found a good way to develop a system that’s right for us and that we understand when they (the consultants) are gone." With prospect-collection underway, the student administration team now turns its full attention to development of the application management process for Fall 2000 using the new system. Migration of all student data records and services is targeted for conversion to PeopleSoft Systems in Spring 2001. Managers for the University's new Integrated Administrative Systems project gathered recently to celebrate implementation of the first phase of the software for users in admissions and related offices. From left are Leo Neveu, chair of the IAS Steering Committee; former Executive Vice President Carl Carlucci; Michael DeRensis, student administration functional implementation team leader; Marybeth Salmon, project manager; and Ginger Bailey, student administration technical implementation team leader. The National Science Foundation has awarded the University a $1.3 million grant for training high school teachers to teach science research courses. Project director Daniel Wulff of the Department of Biological Sciences faculty said the project will be used to train 280 high school teachers over a five-year period to teach a unique science research course. "We are delighted with the NSF grant approval, because it will allow a major expansion of this unique course to all parts of New York State and to selected locations in the Midwest, Far West, and South," said Wulff. The grant follows a previous $400,000 NSF grant to the University that allowed 90 New York State teachers to be trained from 1996-1998. The science research course was developed by Dr. Robert Pavlica at Byram Hills High School in Armonk in 1990, and was first replicated by Leonard Behr of Taconic Hills High School in Philmont. Pavlica and Behr are project co-directors. This year, 19 students (from 16 schools) taking the science research course won Westinghouse-Intel awards. Most of these schools had never had a Westinghouse winner before they began the course. All five of this year’s winners of the Upstate New York Junior Science and Humanities Symposium (JSHS) were also enrolled in the course. The top JSHS winner, Cullen Blake of Bethlehem High School in Delmar (who won a $4,000 scholarship and will represent Upstate New York at the National JSHS Symposium in San Diego May 13-16), identified a particular star in the Hercules cluster as a "delta scuti" variable star and determined its period of variation. He spent many hours using a telescope in the Albany area that was built by an amateur astronomer. Blake has been awarded observation time at the Kitt Peak Observatory in Arizona this summer, and will matriculate at Princeton University next fall. In the course, which has grown from two schools in 1994-1995 to 100 in 1998-1999, a student selects a project and is the prime initiator of its research. The teacher shows the student in the first year how to access the scientific literature, oversees his/her recruitment of scientist-mentors, and when appropriate helps the student find research laboratories in which to work. The second year of the three-year course is devoted to research; the third year emphasizes the communication of results at local, regional and national symposia, and at various competitions. More information about the course may be found on the Science Research web site at https://www.albany.edu/rshs. The University has long been home to a rich selection of scholarly journals, offering insights and developments in a broad range of fields. Today, increasingly, those insights are only a click away. A visit to the University Web page listing at https://www.albany.edu/libraries_research/electronic_journals.html offers a quick glimpse of the changing nature of journal publication and the breadth of scholarly activity at the University. Beginning at that page alone, you can quickly access discussions of mathematical problems, opinions on the value of movies as teaching tools in law enforcement courses, audio sound files of lectures by distinguished scholars, essays, poems, newspaper articles, and listings of the contents of certain journals. These virtual explorations highlight not only the strengths of the journals, but the academic quality of University programs, as well, for, as Edna Acosta-Belén of the Department of Latin American and Caribbean Studies notes, "supporting strong journals is important because a journal is an excellent indication of the intellectual activity that is taking place throughout a campus." In the past, journals were available only in a print medium and via snail mail. Now, increasing numbers of journals are adding electronic components and the "Electronic Journals" web page reflects the different approaches to electronic publishing that have been taken at the University. Scholarly opinion is divided over what effect electronic publishing will have on the integrity and reputation of journals. For Sean Anderson, a graduate student in the Department of Criminal Justice and founding and current editor along with Greg Howard of the Journal of Criminal Justice and Popular Culture, electronic journals are not the future, but the now. The journal began in 1993 when Anderson and Howard began asking how they could incorporate technology into the classroom. They wanted more than the basic online discussions offered in some classes. They also wanted to design a forum where issues in popular culture would be taken seriously and where those interested could engage in and publish scholarly dialogue. The creation of their journal, a completely online, peer-reviewed publication was the answer to each of these desires. Anderson asserts that online journals are unique in that they try to "battle the segmentation between disciplines." As long as the article is sound and passes through the peer-review process, then the profession of the person who wrote it is insignificant. "In more traditional journals, these people weren’t given the chance to speak and make their point heard," says Anderson, whose journal supports a multiplicity of voices. "With some journals, style takes precedence over content. These journals are limiting themselves," he adds. The criminal justice journal currently has about 3,000 subscribers and averages about 15 new subscriptions a month. It is also incorporated into classes at Albany as well as at the University of Louisville (KY). Initially, the choice to go online hindered the Journal and it was not afforded the respect the editors felt it deserved, but this was overcome in a short time. "It now has outstanding support internationally," said Anderson. He mentioned positive feedback from such prominent figures as linguist Noam Chomsky and Thomas Szasz, a Syracuse University psychiatrist working to abolish labels of mental illness. "There is unlimited potential in this medium and more and more people are beginning to grasp it," he explains. The Journal of MultiMedia History, which was started this past fall by editors Gerald Zahavi and Julian Zelizer of the Department of History, shares this view. Its website reads, "we wanted to ‘get out on the Web,’ to reach not only academicians, but an entire universe of interested readers." Mark Steinberger of the Department of Mathematics and editor-in-chief of the New York Journal of Mathematics has also found online success. The journal, which began online in 1994, is high-quality and selective. Steinberger backs that claim up with numbers: a single paper monitored over the course of a week was accessed 184 times here and these results are mirrored in 33 places worldwide by the European Mathematical Society. "We also do a lot of things that other journals don’t," adds Steinberger. The persons reading the journal are given the opportunity to click on individual theorems, linking them to an explanation, which allows them to understand the argument more thoroughly. The New York Journal of Mathematics also has a search function that sets it apart from many of the other online journals. Another journal at the University that has taken future in hand is The Little Magazine. Founded in 1965, it was originally a print publication featuring experimental prose and poetry. Christina Milletti, graduate student in the Department of English and one of four current editors, says that in 1995 the magazine changed its image to an electronic journal published exclusively for the World Wide Web and in CD-ROM format. The Little Magazine is currently working on its biggest project yet, an international anthology of hypermedia literature, called "Gravitational Intrigue: An Anthology of Emerging Hypermedia." Not all journals, however, are published online. Some are still exploring electronic publishing. Acosta-Belén is also the founding and current editor along with Carlos Santiago, Associate Vice President for Academic Affairs, of The Latino Review of Books, an academic journal started in 1995 that links U.S. Latinos with their countries of origin. She says that putting the journal online is a goal that the editors would like to explore in the near future. The Review currently has an informational website listing its mission statement as well as abstracts of current and past issues. Acosta-Belén foresees that an online journal will become increasingly important as more libraries experience space problems from growing numbers of books. The Latino Review has already grown through available technologies, by linking to 16 professional networks and organizations and connecting to websites nationally and internationally. Ramaswamy Sarma of the Department of Chemistry and current editor-in-chief of the Journal of Biomolecular Structure and Dynamics agrees that there are advantages to electronic components, but he also explains that they are limited. "Technology changes so fast. Machines are continually being outdated. So even though online journals are fashionable right now, they have no long-term benefits," says Sarma. His journal started in 1983 and in 1997 found it useful to add an online supplement composed of abstracts and journal instructions. Sarma adds that there has not been much demand for a completely online version. Richard Hall of the Department of Sociology and current editor of the Sociological Forum supports this point of view: "I see electronic journals in the future, but there are a lot of issues along the way that need to be resolved. "First of all, I’m not sure if the field of social sciences is ready," and he adds that because electronic journals are unconventional they raise strong concerns about quality control and true peer-review. Hall also notes that online journals run the risk of bypassing important people who are not yet online either because of an age gap, socioeconomic variables, or other intervening circumstances. Yet Sociological Forum is the fourth most cited journal in sociology out of hundreds. "A journal’s success depends on how often it is cited and used," said Hall. "If you publish material online and no one cites it, then it is just floating in cyberspace." The Center for Women in Government is offering its 2000 Fellowship on Women and Public Policy, a January through July program designed to encourage graduate students to pursue careers in public policy while raising the capacity of New York State government to address issues of concern to women. The program is open to women who are matriculated in any graduate school in the state, in any discipline, who can demonstrate an interest in public policy and promise as a public policy maker. Fellows are given a $9,000 stipend that covers living expenses during the seven-month period. Participants are required to take three graduate seminars at the University’s Graduate School of Public Policy free of charge, for which 10 graduate credits are given. This program also includes a 30-hour per week intensive policy placement in the New York State legislature, a state agency, or a nonprofit statewide advocacy association. Applications and all supporting material for fellowships must be submitted by May 15 to the Center for Women in Government. For applications and additional information, contact Dorothy Hogan, Fellowship Program Coordinator, at 518-442-3875, or e-mail cwig@cnsvax.albany.edu. Noted local physician and author Daniel R. Tobin will be the featured speaker April 28 of the Ringel Institute Lecture. Tobin will speak on, "Social Work and Practical End-of-Life Care: The FairCare Model," in a program sponsored by the Ringel Institute of Gerontology and the School of Social Welfare and scheduled for 3 to 5 p.m. in the Performing Arts Center’s Main Theatre. Tobin, co-author of the recently published book Peaceful Dying: The Step-by-Step Guide to Preserving Your Dignity, Your Choice, and Your Inner Peace at the End of Life, developed and directs the FairCare Health System, a clinical and educational non-profit program for health care practitioners. FairCare offers a comprehensive, flexible process for end-of-life care that takes into account the individuality of each person’s life and death. A consultant in the field of Hospice/palliative care medicine, Tobin also has experience as a primary care physician and as co-founder and director of The World Children’s Foundation, which addressed the problems of childhood hunger. He attended Albany Medical College and later worked with Dr. Michael Murphy, a pioneer of the American Hospice movement. In Peaceful Dying, Tobin advocates accepting death as a natural, and even enriching, part of life. He offers suggestions – such as confronting and expressing the fear of dying, and discussing questions and fears with doctors – that allow the patient to establish control and experience a peaceful death. Tobin also discourages assisted suicide, pointing out that people who resort to suicide most often fear the pain and the loss of control that usually accompany dying, as well as the inability to care for themselves. The lecture is free and open to the public. A reception will follow in the Futterer Lounge. For more information, contact Mary McCarthy at the School of Social Welfare, 2-5338. Frank Wiley, chief of the University Police Department, has announced that a statistical report done in the first quarter of the year shows that overall crime on the Unversity’s campuses is down 4.1%, with felonies down 38.0%. Misdemeanors and violations remained almost constant. Alcohol related reports are higher than last year, as are arrests, with petit larcenies having risen the most. The department is responding, said Wiley, by stepping up its "Gotcha" campaign, whose aim is to sensitize the community. Wiley said, "These are the most favorable quarterly statistics in our history and we continue to have success in suppressing major crimes." A task force comprised of professors, college presidents, chief academic officers and students met on April 7 for the second time to help work out details and guide campuses as they implement the new statewide standards for general education courses offered by SUNY. The Provost’s Advisory Task Force on General Education also gave an update to the General Education Subcommittee of the University’s Board of Trustees. "The enhancement of General Education curricula is something that all of us in higher education embrace," said task force co-chairman Muriel A. Moore, president of Buffalo State College. Moore said the first action of the task force was a survey of every college president, gathering the questions and issues that must be addressed by the task force and the Board of Trustees. "Now that the trustees have set broad guidelines, many important issues need to be addressed to help campuses strengthen and improve their core curriculum," said Provost Peter D. Salins, whose staff is working with the Advisory Task Force. "Given the flexibility of the December resolution, we needed a mechanism to help the campuses work through the details and it was the Chancellor’s decision that the best way to do this was through the task force, which represents all sectors of the University and every key constituency. The resolution approved by the trustees in December sets out a very flexible framework for general education and gives us nearly two years to effect its implementation." Salins added that "the trustees set down 10 subject areas — not specific courses — and said that there should be no fewer than three credits in each of the knowledge and skill areas." "The University Faculty Senate report provides a model that we are striving for in terms of learning outcomes," said Brockport President Paul Yu, who is leading the subcommittee on the academic subject areas. Also serving on President Yu’s subcommittee are three professors: Norman Goodman of Stony Brook, Miles Wolpin of Potsdam and Marvin LaHood of the State College at Buffalo. Also at the April 7 meeting, trustees Randy A. Daniels and Paul R. Perez, who co-chair the General Education Subcommittee, said the board will likely allow some flexibility to those campuses that cannot implement all of the new general education standards by the Fall 2000 semester. Daniels and Perez also said the board will seek the resources necessary for campuses to meet the new general education standards. Binghamton University Provost Mary Ann Swain, who is leading the Task Force’s subcommittee on Resource Allocation, said some campuses may be able to use Internet courses, a proposed library network, and other innovations to meet the new requirements. The SUNY system has been ranked among the best educational institutions in the country for innovative use of information technology (IT), according to the leading news weekly covering that issue. In a recent issue of PC Week, SUNY was ranked 7th among educational institutions in a listing of "Fast-Track Technology Innovators." The same report ranked SUNY 11th in a combined list of top "100 IT Innovators in Government and Education." The rankings demonstrate how these institutions, by using the latest technology in creative ways, improve upon the way information and services are delivered to students, employees and taxpayers. "Our success in the PC Week rankings is a testament to SUNY"s use of the latest and most innovative information technology applications aimed at making a difference in the lives of our students, those in business, and the people of New York," said Chancellor John W. Ryan. Albany, along with campuses at Binghamton, Geneseo, Buffalo, Fredonia, Oswego, Stony Brook and Plattsburgh, was placed in the magazine’s top-100 rankings. The survey pointed to the SUNY Learning Network, a program allowing students to take courses online from anywhere, anytime (more than 6,000 are currently enrolled) as evidence of the system’s placement at the forefront of the information age. The Learning Network expects to offer close to 1,000 online courses during the next academic year, and is moving toward the creation of a virtual library throughout the system. The rankings, developed with Ziff-Davis Market Intelligence, put SUNY ahead of the California State University and dozens of other highly regarded systems, as well as the Smithsonian Institution, nearly every other federal agency and department, and all 50 state governments. An estimated 70 faculty representatives from campuses across the SUNY system will meet at the University Friday and Saturday, April 23-24, for a plenary session of the SUNY-wide University Faculty Senate. It is the first time since 1988 that the Albany campus has hosted the Faculty Senate. President Hitchcock will give welcoming remarks as the session gets under way at 9 a.m. on Friday in the Campus Center Ballroom. Also speaking will be Vincent Aceto, who has been on leave from the faculty of Albany’s School of Information Science and Policy Studies while serving as president of the Faculty Senate for the last four years. Aceto, who was named a Collins Fellow two years ago and holds B.A., M.A. and M.L.S degrees from Albany, said he plans to return to the faculty and continue his work as co-director of the Film and Television Documentation Center. Other scheduled speakers on Friday include SUNY Provost and Vice Chancellor for Academic Affairs Peter Salins and Vice Chancellor Brian Stenson. They will follow Mary Bergen of the Association of Governing Boards, who will discuss "Shared Governance in American Public Higher Education." Campus tours of both the new library and the Center for Environmental Sciences and Technology Management will also be offered. "It’s a wonderful opportunity for us to showcase the exciting changes that we’re experiencing here at the University at Albany," said Audrey Champagne, a professor of education and chemistry who is serving a three-year term as a senator representing the campus. "It is also a significant time as far as faculty relationships with the SUNY trustees, and I expect there will be discussions regarding that." Champagne’s term ends in 2002. Albany’s other senator, Dona Parker, an assistant dean in the College of Arts and Sciences, explained that the Senate meets three times a year — fall, winter and spring. "The Spring Plenary Meeting marks the end of the governance year and is a time when we see the results of this past year’s work by the members of the standing committees," said Parker, who is in the middle of her three-year term. "There will be end-of-the-year reports, which will contain useful information for the campuses, as well as a number of resolutions. "Given the recent joint statement of no confidence in the current SUNY Board of Trustees that was drafted by the University Senate and the United University Professions, I expect our meeting will focus on shared governance in public higher education," said Parker. She added that she considers it "an honor" to have been elected to represent the Albany campus. "One thing I have learned while serving on the University Senate is that we are not an island that can exist in the system without the help and support of the other campuses, and that we are all striving for the same pursuit of excellence," Parker said. "The other senators from across the System are caring and dedicated faculty committed to getting the best for their campus and the system." Members of the Faculty Senate will attend sessions in the Campus Center Ballroom. When the 375 scholars, media and government people from across the nation who represent the seven-year-old Puerto Rican Studies Association voted for new officers and a nine-member executive council in February, the achievements of the University at Albany were prominent in their minds. Elected president of the Association for the next two years was economist and Associate Vice President for Academic Affairs Carlos Santiago. Elected vice president — thereby taking over the presidency two years from now — was Edna Acosta-Belén of the Department of Latin American and Caribbean Studies. And added to their membership on the Association’s executive council was Norma Pol, a Ph.D. student in the Department of Educational and Coun-seling Psychology, elected as a student member. One-third of the elected officers of the Association is now from the University, and the national conference of the group will be hosted here next year. "Albany is the perfect place for it," said Santiago. "I think that these elections are acknowledgement of the strengths in Puerto Rican studies at the University and a recognition that we are truly in the forefront of this academic enterprise. Our traditions are strong, and so is our current visibility." The University formed one of the first Puerto Rican studies programs in the nation in 1970, and it ascended to department level in 1974, with Acosta-Belén its first chairperson. The graduate program in Latin American and Caribbean Studies is the only one in SUNY, and one the leading such programs in the nation. The Latino Review of Books, edited by Acosta-Belén and Santiago, is also produced at Albany. "Our objective with the Association is to expand the membership base, stabilize the leadership and finances, and to have an excellent conference next year," said Santiago. "I am confident we will do all of that." William N. Fenton, professor emeritus of the Department of Anthropology, is being honored by Yale University at its graduate school commencement on May 23. In recognition of his long, distinguished career of research and scholarship, Fenton will be awarded the prestigious Wilbur Cross Medal. Leonard Slade Jr. of the Department of Africana Studies was featured on an April 6 Schenectady Cable Television Channel telecast, reciting poetry from his most recent book, Lilacs in Spring. Slade, who also teaches in the Department of English, has written a total of nine books of poetry. He joined the faculty in 1988 and currently teaches courses in black lit-erature and poetry. His cable television presentation was identical to a reading he gave at Barnes & Noble bookstore on Valentine’s Day. Slade’s poetry has been praised by Maya Angelou, Houston Baker of Duke University, and the Pulitzer Prize-winning poet Gwendolyn Brooks. Benjamin Fordham of the Department of Political Science, along with Janice Steiner, a senior honors student in foreign policy, will be the University’s representatives today in New York City as SUNY kicks off a new collaborative program with the Foreign Policy Association, the country’s oldest non-partisan organization dedicated to public education in international affairs. SUNY is entering into partnership with the FPA to help students and faculty in exploring international affairs, including through the development of new curricula. This collaboration will take many forms and one of the first is the FPA’s annual luncheon today, which will feature NBC television correspondents as special guests. They will discuss the war in Serbia and other international issues. Last fall, the Department of Languages, Literatures, and Cultures welcomed noted scholar David Wills as faculty member and department chair. Wills says he chose Albany because there "seemed to be something exciting happening in the humanities." Part of his excitement stemmed from the prospect of working with Tom Cohen, chair of the Department of English. Together, Wills and Cohen are tackling what a humanities education means in this day and age and how this is changing. They are developing several initiatives to explore answers to these questions. "Book/Ends," for example, a conference planned for 2000, will explore the status of the book in the new millennium as we move from a print to a media culture. Wills is also actively involved with the Center for Arts and Humanities and is exploring its role in a humanities education. Wills "has the qualities not only of a great scholar, but also of a great facilitator," says Richard Hoffman, Dean of the College of Arts and Sciences. Hoffman added that Wills is "working hard to bring the programs that previously existed independent of one another into a single unified department." Wills has orchestrated the hiring of three new faculty members, all in the area of Spanish, where they were much needed. At the University level, Wills is on the general education task force, where he believes he can make a contribution in terms of foreign language requirements. Pursuing a life-long interest in foreign language, Wills attended the University of Auckland in New Zealand, where he double majored in French and English. Graduating with a B.A. in 1974, he stayed at Auckland to earn his M.A. in French with First Class Honours. While at Auckland, he won the Senior English Prize and the New Zealand Universities Postgraduate Scholarship. In 1976, Wills won a scholarship from the French government and attended the Université de la Sorbonne Nouvelle, where he earned his Ph.D. in 1979. Wills began his teaching career in Australia at James Cook University of North Queensland. There he also served on the university’s executive committee, as computer representative and coordinator of visiting lecturers, library liaison officer, and as an elected member of the faculty of arts committee. In 1985, Wills joined the faculty at Louisiana State University, where he taught in French and comparative literature, winning numerous grants and scholarships. He served as chair for the department of French and Italian from 1993-1997, and his tenure also included several campus advisory roles, impacting comparative literature, the French and Francophone studies, and audio-visual arts. He was a visiting research associate at the City University of New York in 1991 and a visiting professor at the Université de Provence in 1997. Wills’ large resume of publications, conferences, and guest lectureships has been inspired by his intense interest in French author Jacques Derrida and in film theory. In the early 1980s, Wills contacted Derrida and began translating some of Derrida’s work. This was the initial spark in a relationship that has spanned almost two decades. Derrida will come to the University next October to speak on the future of the humanities. Wills’ professional affiliations include membership in the Modern Languages Association, the Society for Cinema Studies, and the International Association for the Study of Philosophy and Literature. "He is a great addition to the University," said Hoffman. "It has been my pleasure to work with him." This past January, distinguished scholar and expert of Latin American politics Edwin Aguilar joined the Department of Political Science. 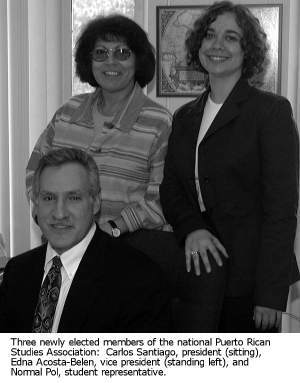 After receiving a bachelor’s degree in political science from Pan American University, Aguilar went on to attain a master’s degree and doctorate (1995) from the University of North Carolina at Chapel Hill. Throughout his academic career, Aguilar received several grants supporting his work. Most recently, he was presented with the National Science Foundation Minority Research Planning Grant for his research on The Political Economy of the Informal Sector in Latin America: A Comparative Study of Costa Rica, Mexico, and Nicaragua. Aguilar has also been the recipient of the Texas A&M Honors Curriculum Development Grant and the Texas A&M faculty mini-grant. Aguilar has also received various fellowships such as the National Science Foundation Minority Graduate Fellowship, the Mellon Fellowship, and the Tinker Fellowship. Aguilar’s teaching experience before coming to Albany includes an assistant professorship at Texas A&M University, a graduate instructorship at the University of North Carolina at Chapel Hill, and a teaching assistantship at the University of Kentucky. Fluent in Spanish and English, Aguilar has conducted extensive research in Latin America, primarily in Costa Rica. His research interests lie in U.S.-Mexico border issues, including political, social, and economic concerns; public opinion research in Latin America; informal labor in Latin America; political behavior of Latinos in the U.S. economic development; and political behavior in Latin America. He is the author of numerous publications and also is a reviewer for American Journal of Political Science, Journal of Politics, and the Political Research Quarterly. Aguilar’s research skills also include extensive methodological training in data analysis techniques, introductory demography, regression and associated techniques, and log-linear models. He also has proficiency in six computer languages. Aguilar is currently teaching an undergraduate course, "Latin American Politics," and a graduate course, "Economic Relations in Latin America: Topics in Comparative Politics." In the fall, he will also be teaching a course in quantitative methods. Bruce Miroff, chair of the department, calls Aguilar "a scholar with an impressive background in Latin American politics." Miroff said that Aguilar is fully involved in the department and has already served on a committee to react to doctoral dissertations for University awards. 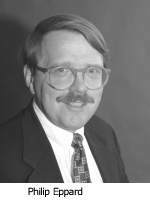 Donald Axelrod, emeritus professor in the Department of Public Administration & Policy and former chairman of that department, died on March 16 at his home in Slingerlands after a long battle with cancer. A doctoral graduate of the Maxwell School of Syracuse University, Axelrod began teaching courses at the University in 1948 through a program in public administration created in conjunction with the Maxwell School. When the University’s department was created in 1967, Axelrod became a faculty member and later its chairman. Axelrod retired in 1971 from the New York State Office of the Budget as assistant state budget director after a 26-year career in public administration. He also served as a consultant to several foreign governments, including Turkey and Thailand, and was the author of several books, including Budgeting for Modern Government and Shadow Government: The Hidden World of Public Authorities. Both are now used as textbooks in many universities. 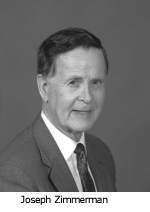 He was a member of the American Society of Public Administration. In his new book, The New England Town Meeting: Democracy in Action, Joseph Zimmerman of the Graduate School of Public Affairs — and a New Hampshire native — explores a uniquely democratic feature of an historically independent-minded region of the U.S.A.
Zimmerman has always been interested by the town meeting and began formal study on the subject in Massachusetts during the 1950s. The New England town meeting has remained largely unexplored in terms of research and Zimmerman, in his new book, provides the most recent and comprehensive material available. Rich in history, the New England town meeting is one of only two direct democracy institutions in the U.S. involving lawmaking by assembled voters, the other being the New England school district meeting. Town meetings began in the Massachusetts Bay Colony in 1629, without official authorization, grew rapidly in number in the colony, and eventually played an important part in the events leading up to the Revolutionary War. Though hundreds of years old, New England’s open town meetings function now very much like they did then, except that now women are active participants and some states have an official Town Meeting Day. Thomas Jefferson captured the power of the town meeting when he said that it acts as the "cement" which binds the people together as a community. Zimmerman incorporates the views of prominent figures such as Jefferson and Ralph Waldo Emerson, another town meeting proponent, and addresses critics such as James Madison. Some change, however, has been inevitable and Zimmerman provides an in-depth look at the changes taking place. In some New England towns, a shift has occurred since 1915 from open town meetings to representative town meetings where voting is restricted to elected town meeting members representing the various precincts. In open town meetings, everyone is entitled to vote. Currently, the open town meeting remains more popular, with the representative town meeting in only 51 New England towns. Critically examining the various facets of this representative legislative body, Zimmerman looks at the dynamics of the town meeting as they have evolved in each of the New England States. He assesses areas such as quality of meetings, effectiveness in lawmaking, and the contentment of the citizens. He looks at how different sociological factors impact the town meeting. Television and commuting to and from work, for example, are responsible for a decline in attendance and newer residents are more active in town meetings than long-term residents. Such factors are important because they effect how each town meeting, in different New England states, functions. Zimmerman concludes that the town meeting is on its last legs in Rhode Island where 10 towns have done away with it completely and the other 21 only convene for a financial town meeting where attendance is not above 5.3%. However, in other areas of New England, such as Massachusetts, the town meeting, though facing changes, is far from extinct and is still an integral legislative body as well as an influential factor on U.S. political thought. 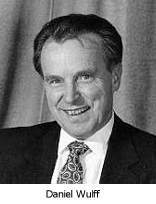 Zimmerman is the author of numerous other books, including The Recall: Tribunal of the People (1997) and Interstate Relations: The Neglected Dimension of Federalism (1996). "These questions spurred me to explore the topics in economics and econometrics that interest me today, and to encourage others to join me in this discovery." Dewar received a 1993 Ph.D. in economics from Albany and began teaching here the following year. Previously, she served on the faculty of the University of Winnipeg, Manitoba, while completing her dissertation. While in Manitoba, she served as a consultant for provincial utilization review programs. Her work, Dewar points out, has given her a unique analytical perspective by allowing her to "personally experience health care utilization issues under both the Canadian and U.S. health care delivery systems. In insurance and hospital research positions in New York State, I assisted in the development of databases to track health outcomes and costs related to episodes of care. Those opportunities were invaluable for both my research and teaching." Dewar says her experiences promoted "the evolution of my overall research agenda, investigating the impact of insurance and delivery system changes on access to, and the utilization of, health care. From an economic perspective, I analyze what affects the usage and costs of different types of health care, given that there are several different ways to pay for these services. "My work follows two closely related paths: One examines the impact of health care reforms and other public policies on the access to different types of insurance coverage; the other analyzes how changes in insurance coverage affect the amount of health care people use and their resulting health status." Over the years, her work has had broad appeal. She has made numerous conference presentations and published in economics, medical, and policy journals that include the International Journal of Technology Assessment in Health Care, Economics of Education Review, the Review of Social Economy, and Critical Care Medicine, as well as in the proceedings of national and international conferences. She is now at work on book chapters and other manuscripts primarily focusing on the optimal use of high-cost medical technology in hospitals, long-term care facilities, and home-health settings. Currently, Dewar is teaching graduate courses ("Introduction to Health Policy Analysis and Management," "Health Economics," and "Applications in Health Policy Analysis and Evaluation") cross-listed with the Department of Eco-nomics; she also mentors many students in master’s essays and dissertations. She feels that designing her courses has been one of her chief accomplishments because she has "been able to fulfill a core content need in the M.S. program in HPMB, and enrich the offerings in the public economics sequence in the M.A. program of the Department of Economics. In addition, my role in the development of an integrated Health Policy and Management track in the M.S. program has formalized the complementary training requirements of these concentrations." Dewar clearly enjoys teaching, which affords her "the opportunity to blend my research areas with my teaching agenda. I also enjoy working with students learning to apply economic methods to health care issues for the first time. Often, they begin my courses shocked by the economic paradigms used to analyze health care issues. I’m always gratified to have my students tell me that they’ve used the tools taught in class on the job or in their internships." According to department chair Edward Hannan, Dewar’s joy in teaching is evident. "In her health economics courses, Diane has a knack for making very difficult principles and theories understandable to the students. She also teaches, with distinction, our introductory methods course in health policy and management. As a result, many non-matriculated students have converted to matriculated status." A University Innovation Fund for Teaching Award in 1996 enabled her to incorporate a policy-oriented computer simulation laboratory into her capstone course, "Applications of Policy Analysis and Evaluation." The award also allowed for the institution of an Internet discussion group, in which students participate with faculty and students from other Universities, other researchers, and health care practitioners around the nation on health care reform issues. Philip Eppard, dean of the School of Information Science and Policy, will be the principal investigator and director on a grant for the American component of an international research project on the preservation of electronic records. The grant, from the National Historical Publications and Records Commission, a grant-funding agency of the National Archives and Records Administration, is authorized for $425,000 for 18 months. Anne Gilliland-Swetland of the department of library and information science at UCLA will serve as co-director of the grant project. The project, known as the InterPARES Project (International Research on Permanent Authentic Records in Electronic Systems) will investigate and develop the theories and methodologies required for the permanent preservation of authentic electronic records. "We have a rather ambitious set of goals for this project," Eppard said. "Ultimately, we aim to formulate model policies, strategies and standards for ensuring that authentic electronic records will be preserved over long periods of time." The University is the American headquarters for InterPARES, a three-year collaborative project based at the University of British Columbia. It involves teams of researchers from Canada, the U.S., Italy, the United Kingdom, Australia, the Netherlands, Sweden, Japan, China, and Hong Kong. In the U.S., faculty and researchers at UCLA, the University of Missouri, Georgia Tech, and Penn State are all involved in the project in collaboration with electronic records specialists at the National Archives in Washington D.C. Researchers from other countries will be working with representatives from their respective national archives as well. In addition, the Collaborative Electronic Notebook Systems Association, representing a worldwide industry group including pharmaceutical, chemical, biotechnology, high-tech, and other businesses who are interested in developing electronic lab notebooks, is participating in the research. Because of the fragility of the medium and changes in hardware and software, the task of preservation is formidable. Records will need to be moved to different platforms or software packages in order to be maintained permanently, but throughout these processes, there will need to be an assurance that the records are as authentic as they were when they were first created. "This project is distinctive in that it brings together archivists, records managers, preservation experts, and computer engineers from around the world to deal with what is a worldwide problem, "Eppard said. "If our project is successful, people who need to access information from records created electronically in the 1990s will have a guarantee that those important electronic records have survived and are authentic." In some parts of the world, reindeer are important every day of the year, not just when Santa Claus is in town. This summer, Robert Jarvenpa, professor and chair of the Department of Anthropology, and Hetty Jo Brumbach, associate curator of Anthropology, will be traveling to a part of the world where people rely on reindeer as a source of income and food. Their destination is Finnish Lapland, where the land is unsuitable for farming. Small clusters of families make their living by hunting, trapping, fishing, and selling furs. One of the topics the researchers will be studying is gender roles in the herding and management of reindeer. Later in the summer, Jarvenpa and Brumbach will do comparative work with Alaskan Inupiaq peoples in the Bering Strait, where small clusters of families make their living by fishing and sea mammal hunting. 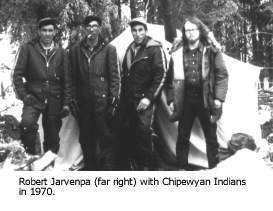 Jarvenpa has been studying circumpolar hunting and foraging peoples, beginning with the Han and Chipewyan Indians in northern Canada, since 1970. He spent his first year there as an apprentice hunter, sleeping in temperatures of 50 degrees below zero and eating whatever his group could hunt, fish or trap. 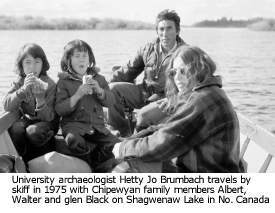 Brumbach spent her first summer among the Chipewyan in 1975. "We were anxious to pack in as much research as possible, so we worked from sunup to sundown," said Brumbach. "That meant we were working 20 hours a day. We also traveled by canoe much of the time. It was exhausting. There were no roads in this part of the world until 1977, and we were following the people's traditional travel circuits which covered vast distances." Brumbach and Jarvenpa are principal co-investigators of a project called Gender Dynamics and Subsistence Systems in Circumpolar Societies: an Ethnoarchaeological Interpretation. The study is funded by a $204,500 National Science Foundation grant. This summer the researchers, three teams of international consultants, and Albany anthropology graduate student Scott Williams will join the Saami people of Lapland and the Inupiaq, Eskimo people living on Little Diomede Island in Alaska, in the Bering Strait. Next summer, the work will conclude among the Khanty people of western Siberia, with the goal of examining how labor is divided between males and females in that culture. These can be critical questions in economies where the ability to work interdependently as a couple and in an extended family is key to economic survival. Brumbach, as an archaeologist, and Jarvenpa, a cultural anthropologist, each adds a unique perspective to this question of gender roles in subsistence economies. "What we find can help us to build models for interpreting the past," Jarvenpa said. "We wish to dispel the myth that women in the past were tethered to the hearth and home," said Brumback, "when in reality women in foraging societies may lead very active lives. We have to be careful not to impose our own gender stereotypes onto other cultures." Added Jarvenpa "The logistics, planning, tracking, and actual killing of an animal, plus the processing and manufacturing and production from the kill afterwards are elaborate operations, requiring a high degree of cooperation. "All of that requires interdependence between men and women," he said. "A Western sport model of hunting has no meaning in societies where people are hunting for their food." In the first phase of their research in the early 1990s, the scholars found that Chipewyan women often maintain their own trap line, checking daily for rabbit or muskrat. A woman will bring her granddaughter or daughter along with her each day on her rounds to retrieve what has been caught, training her to hunt. "Men's hunting activity is also carried out but at a different scale," said Jarvenpa. "The women hunt daily but at close range. The men hunt intermittently but cover larger distances." Often a husband and wife will go hunting, trapping and fishing together until they have children. The wife will stay near camps and villages while the children are young, and the husband will hunt with a brother, father or brother-in-law. Once the children are older, the wife resumes hunting. "Archaeology sometimes uses a simple gender model that does not fit what people do," Brumbach added. And while the Chipewyan people move nomadically to make their living, and appear to be very different from Westerners, they have been wearing Western clothing, using steel tools and firearms for 150 years. In addition to traveling by dog sled, they have used snowmobiles since the 1960s. The Khanty people of Western Siberia and the Saami of Lapland, also raise domestic reindeer in addition to hunting, trapping and fishing. The reindeer roam relatively freely for part of the year, then are herded at specific times, in order to mark new calves, for example. "We needed to pick an Old World population of hunters that manage the herds in an Arctic ranching economy," said Jarvenpa. The ear cuts with which the reindeer are marked are passed down from generation to generation and are sometimes owned by women. Calling it "arduous but exciting work," Jarvenpa and Brumbach are fully equipped to handle the rigors of the field research. On a previous trip to northern Saskatchewan, a black bear ripped apart their camp after smelling freshly smoked fish. Unhurt and undeterred from their research, the group packed up in the middle of the night and moved to a more suitable location. What caused biology to begin is one of life's greatest mysteries, starting with the question of how a 6 billion-unit strand of human DNA could be created. The University's chapter of Sigma Xi, in conjunction with The First Unitarian Universalist Society of Albany, on Monday, April 26, will present an esteemed scientist who believes that the Earth's forces had an innate sense of cooperation. 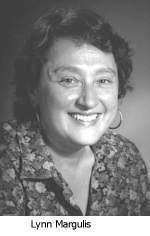 Lynn Margulis, a distinguished professor in the geosciences department at the University of Massachusetts, will deliver the Seventh Annual Channing Lecture on at 7:30 p.m. in Page Hall. A reception will follow the event, which is free and open to the public. Margulis will discuss "Gaia: Our Living Earth From Space." The lecture will focus on the recommendation that religious thought be informed by science. Gaia, named for the Greek goddess of the Earth, is the hypothesis that the Earth acts as a self-regulating, self-maintaining system. For centuries, beginning with Darwin, the belief grew among the scientific community that purely physical forces formed the Earth. The advance of science in the last 50 years, however, has shown the billions of chemical intricacies and decisions necessary to make Earth a reality. With no concrete answer to this puzzle, many — including a growing number of scientists — now have returned to the belief that is indeed God's doing. Margulis' views are often considered controversial by both science and traditional religion because of her symbiotic theory, in which she theorizes that life evolved through cooperation and symbiosis — dubbed "Gaia" by author William Golding — instead of competition or survival of the fittest. The author of more than 130 scientific articles and seven books, Margulis writes about a wide range of scientific topics, including cell biology and microbial evolution. An authority on the microcosmos, her work focuses on the role of microorganisms in the past 3.5 billion years of evolution. She teaches courses on organelle genetics, symbiosis and evolution. Her current research concerns study of life cycles, and sediment impact of the inhabitants of microbial mats. Margulis has been elected to the U.S. National Academy of Sciences and the Russian Academy of Natural Sciences. She earned her Ph.D. in genetics from the University of California at Berkeley. She has been called the most gifted theoretical biologist of her generation. The Channing Lecture explores the Unitarian Universalist seventh principle, which is "Respect for the interdependent web of all existence of which we are a part." Sigma Xi is a scientific research society. Other sponsors of the event are the New York Center for the Studies on the Origin of Life, the University's Department of Biological Sciences, and the Albany Area Chapter of the Association for Women in Science. The University's Chapter of Phi Beta Kappa, Alpha Alpha of New York, which is celebrating its 25th anniversary this year, will initiate some 40 new members on Sunday, May 9, precisely 25 years to the day after its first initiation was held at Albany in 1974. The ceremony will take place at 4 p.m. in the Recital Hall of the Performing Arts Center, with a reception to follow in the Futterer Lounge. In honor of the occasion, University President Karen R. Hitchcock will bring greetings, and Professor Emeritus DeWitt Ellinwood, the chapter's first president, will speak on the founding of the University's chapter. Mary Beth Winn of the Department of French Studies, who is secretary of the Albany chapter, said that Phi Beta Kappa, established in 1776, is the nation's oldest and most respected undergraduate honors organization. Its name comes from the initials of its Greek motto meaning "Love of wisdom, the guide of life." Its mission is to foster and acknowledge excellence in the liberal arts and sciences. The Society's distinctive emblem, a gold key, is widely recognized as a symbol of academic achievement. The Alpha Alpha Chapter elects approximately 60 students each semester, according to Winn. They are inducted into membership at an initiation ceremony whose ritual has been in use for more than 200 years. "Members are elected from candidates for degrees in the liberal arts and sciences, usually from the upper tenth of the graduating class," she said. Unlike other honors, Phi Beta Kappa invitations are extended to students at the end of their undergraduate years to acknowledge the excellence of their records. Election is based not only on academic achievement as measured by the GPA, but also on the breadth of study in the liberal arts and sciences. Only 255 chapters of Phi Beta Kappa exist nationwide among more than 3000 undergraduate institutions. Obtaining a chapter is a three-year process involving careful scrutiny of the undergraduate liberal arts program. At Albany, a devoted group of faculty launched the proposal for a chapter, and at its installation in 1974 there were 99 charter members from the faculty and staff. In all, more than 2,300 individuals have been elected to Phi Beta Kappa at Albany since then. Several years ago, some members of the Albany chapter established the PBK Prize for Academic Excellence, which is awarded each spring to the highest-ranking graduating member of the Alpha Alpha Chapter. The prize was endowed by M.E. Grenander, James W. Corbett, Helen and Bernard Horowitz, Catharine Newbold, Kendall Birr, Jarka and Grayce Burian, and Mary Goggin. Although the chapter's principal activity is to recognize academic excellence through the election of new members, it also sponsors lectures as part of the national Phi Beta Kappa Visiting Scholar Program. The work is organized by the chapter's officers, who this year are Robert C. Howell (philosophy), president; Naomi Zack (philosophy), vice president; Mary Beth Winn, secretary; Malcolm J. Sherman (mathematics), treasurer; and: Martin Edelman (political science), historian. Approximately 120 members of the faculty and staff are current Phi Beta Kappa members, according to Winn, who was inducted as an undergraduate at Vassar College. Members of the chapter, consisting of faculty, staff, and graduate students who were themselves elected to Phi Beta Kappa as undergraduates, select new members after reviewing their academic records. Since 1932, the Society has published The American Scholar, a highly respected journal and sponsors programs to honor and champion the liberal arts. Third baseman Mike Kuebler hit a three-run home run in each game to lead Albany to a New England Collegiate Conference doubleheader sweep over Southern Connecticut State last Saturday at Quigley Field. The Great Danes, who took over sole possession of first place in the conference standings, won the first game, 5-3, and the second, 6-3. Albany (15-12, NECC 11-3) had to rally in the nightcap, after SCSU first baseman Chris Borelli gave his team a 2-1 lead in the fourth with a solo homer. Pat Pickett’s sacrifice fly tied the contest in the seventh, before Frank Cannistra doubled across the go-ahead run in the eighth. Kuebler then belted his fifth home run of the season over the left-field fence. "We find ways to fight back and win," said Albany coach Doug O’Brey, whose team has reached the 19-victory mark the last two seasons. "The offense is scoring nearly 10 runs per game, but the pitching staff has shown savvy and the defense has been better." In the opener, Kuebler homered in the first inning to give the Great Danes a 3-0 lead. Michael Oliva added four singles, while right-hander Jason Trufant allowed six hits and recorded six strikeouts to improve to 3-1 this spring. Tony Gregoli, a senior outfielder who is hitting a team-leading .442, finished with five hits on the day, including three doubles and a solo home run. NOTES: Albany has eleven victories in conference play for the second consecutive season . . .Tony Gregoli has totaled 10 extra-base hits and 16 RBIs over his last eight games . . . Steve Checksfield batted .441 and drove in 15 runs in last week’s play, but saw his 16-game hitting streak come to an end in last Saturday’s opener . . . Michael Oliva is hitting .344 in the lead-off spot with 34 runs and 13 stolen bases. Lindsey Wilson had four hits and scored three runs on the afternoon, and was the nightcap’s winning pitcher as Albany won a pair of New England Collegiate Conference games, 5-2 and 11-4, at Franklin Pierce on April 14. Albany (20-10, NECC 7-3) stayed close to the conference leaders with the doubleheader sweep. Wilson, a freshman hurler, scattered nine hits in the second contest, and is 3-0 on the mound with a 1.91 earned run average this season. In the first game, Jessica Hansen pitched five strong innings of relief with six strikeouts and no walks to record her 11th victory. Senior third base Nancy Nicsevic singled, tripled, and scored three runs. NOTES: Albany has reached the 20-win mark for the third straight year . . . Michelle Mausteller had four triples last week, including an RBI three-bagger in the eighth inning of a 5-3 victory at Union . . . shortstop Valerie Terry, a two-time NECC Rookie of the Week winner, has tied the best single-season mark in the 1990s with 24 stolen bases. Football All-American Matt Caliandro has agreed to terms with the NFL’s Tennessee Titans on a free-agent contract, according to his agent Joe Linta. Caliandro, a 6-foot-5, 254-pound defensive end, will report to rookie mini-camp later this week. Training camp begins in Nashville on July 23. Caliandro is the third Albany player in the last two years to come to terms with an NFL team. Tight end Seth Thomas and wide receiver Dan Gmelin were in the Carolina Panthers and San Diego Chargers training camps, respectively, last summer. Thomas is now with the Arena League’s New Jersey Red Dogs, while Gmelin recently inked a two-year deal with the Canadian Football League’s Saskatchewan Roughriders. Caliandro, a first-team Division II All-American of the American Football Coaches Association, led the Great Danes to two consecutive Eastern Football Conference championships. He was the first Albany player to be named to the Associated Press Little All-America team, and finished his career with 185 tackles and 16.0 sacks. The Great Danes prepared for this week’s Penn Relays with a quadrangular meet at University Field on Saturday. Buffalo won both the men’s and women’s competitions, while Albany was second. The Bulls outscored Albany, 190 to 177, in the men’s meet. Ben Wright was one of four individual winners with a time of 3:59.55 in the 1,500-meter run. Andy Rickert (5,000), Brendan Howell (3,000 steeplechase) and Jason Jaconetti (shot put) also finished first for the Danes. In the women’s meet, Buffalo edged Albany by three points in the team totals. Andrea Viger and Janna Johnston were double-winners. Viger captured the 1,500 (4:49.24) and 3,000 (10:43.24). Johnston, who will compete in the heptathlon at Penn Relays, leaped 18-00.25 in the long jump, and won the javelin. Other first-place finishers were Flavia Cass (shot put), Tammy Freeman (800), Tara Bialy (100) and Xiomara Davila Diaz (200). Marissa Tuchband lost in straight sets to Pace’s Amy Maurer in the Great Dane Classic Flight C singles final on Saturday. Maurer posted a 6-1, 6-1 victory. Pace also defeated Albany in the Flight A and Flight B doubles championship matches. Donna Carnicelli and Patricia Thomas upended Julie Bliss and Samantha Kramer in an 8-6 pro-set for the Flight A crown. Maurer teamed with Kim Kaufman for the Flight B title with an 8-3 win over Albany’s Erinn Langford and Jennifer Hahn. Albany’s Bliss (Flight A), Ilissa Strolovitz (Flight B), and Shayna Smith (Flight C) each won her respective consolation singles bracket.